WHERE: American Legion Home, 1740 Fifth St.
WHERE: Lincoln Depot, 101 N. Chicago St. The public is invited to the "Community of Thanks" concert on Sunday, Nov. 18, at Lincoln Christian College and Seminary in Lincoln. The concert will be at 4 p.m. at the Earl C Hargrove Chapel. Lincoln area choirs and soloists will perform. The Festival of Trees in Lincoln is looking for individuals and organizations willing to volunteer at the festival site as tree sitters. The festival runs Nov. 23-Dec. 2. It will be open at the Logan County Courthouse 9 a.m. to 7 p.m. Monday through Saturday and noon to 6 p.m. on Sundays. For the candlelight courthouse tour on Tuesday, Nov. 27, and the Christmas parade on Thursday, Nov. 29, the Festival of Trees will be open until 8:30 p.m.
Tree sitters welcome visitors, assist with voting for a people’s choice award, sell tickets for the public raffle tree and keep watch over the trees. They generally work two-hour shifts. People interested in tree sitting should contact Georgia Vinson at 732-9069. The Festival of Trees is presented by Main Street Lincoln and the Abraham Lincoln Healthcare Foundation. Lincoln Land Communications is the premier sponsor. Three lucky people from Lincoln who attended the Lincoln College Alumni Casino Night on Saturday night walked away winners. Delmar Turner had the lucky ticket number for the grand prize of overnight accommodations at the Par-a-dice hotel in East Peoria. Kevin Stephens couldn’t believe he held a winning ticket and had to ask for the number to be read again. He won four tickets, including a parking pass, to see the Chicago Bulls take on the Boston Celtics on Dec. 8. Bill Martinie was the last winner to be picked. He won four tickets to the Chicago Bears vs. Detroit Lions game on Dec. 2. Main Street Lincoln is currently compiling information about upcoming holiday events to be included in the "Season’s Schedule." To be listed on the schedule, events should be hosted by or for not-for-profit organizations, churches or schools and should take place in Logan County during the time period from Thanksgiving Day, Nov. 22, through Dec. 31. Submissions should include the name of the event, a short description, dates, time, location, ticket price and details, the sponsoring organization, and a telephone number to call for further information. Information concerning events in November should be received at the Main Street Lincoln office no later than Nov. 8; information on December events should be sent by Nov. 15. If at all possible, submissions should be e-mailed to manager@mainstreetlincoln.com or faxed to 735-9205. Event information can also be dropped off or mailed to Main Street Lincoln, 303 S. Kickapoo (second floor), Lincoln, IL 62656. For further information, call (217) 732-2929. The town of Normal and the Illinois Clean Energy Community Foundation are co-sponsoring an Integrated Design Workshop on Nov. 15, from 8:30 a.m. to 5 p.m. at the Holiday Inn at 8 Traders Circle in Normal. The workshop will focus on high-performance building techniques, which incorporate energy efficiency and other environmentally sensitive building techniques into both new and existing construction. Expert speakers will discuss the implementation of high-performance building techniques, including high-efficiency building materials and alternative energy production, and their impact on energy consumption, storm-water detention and solid waste reduction. Transportation issues will also be discussed. Because the Illinois Clean Energy Foundation envisions the future incorporation of these high-performance building techniques into development throughout the state, the foundation is encouraging citizens from all over central Illinois to attend the workshop. The event is open to the public. Please contact Mercy Davison at (309) 454-9623 if you have any questions. The 2001 Logan County Christmas tree project in the Logan County Courthouse rotunda is being sponsored by Logan County residents again this holiday season. The 18-foot tree is displayed annually from mid-November through the holiday season. All ornaments have been donated by area residents. Churches, businesses, families, schools, service clubs, organizations and individuals are again encouraged to donate ornaments. • The ornament should not exceed 6 inches square or weigh more than 8 ounces. • All ornaments must be submitted in an appropriate size box for future storage. • All ornaments will be identified, labeled and recorded in a permanent register on display at the tree location. Label information sheets may be picked up at the security guard desk at the Logan County Courthouse, or people can contact Mrs. Ted (Judy) Awe, 123 Crestwood Drive, Lincoln, IL 62656-1360; phone (217) 732-4758. Ornaments will be received at the security guard desk in the Logan County Courthouse beginning Nov. 1. Organizers of the Festival of Trees are seeking businesses, organizations and individuals interested in sponsoring trees, wreaths and swags for this year’s dazzling display at the Logan County Courthouse. The festival will be Nov. 23-Dec. 2. Items are sponsored to provide visibility for businesses and organizations or in memory of someone. Sponsors are responsible for decorating their items or arranging for someone else to decorate them. Sponsorship fees are $200 for 7½-foot trees, $100 for 4½-foot trees and $50 for wreaths or swags. Trees, wreaths and swags will be auctioned at the Festival of Trees Gala on Nov. 24. Proceeds will be used by the Abraham Lincoln Healthcare Foundation in improving the quality of health care in Logan County and Main Street Lincoln in revitalizing downtown Lincoln. For more information or a sponsorship form, contact Jan Schumacher, festival chairman, at 732-7101 or the Main Street Lincoln office at 732-2929. Lincoln Land Communications, a Cingular wireless authorized agent, is premier sponsor for the festival. The Lincoln Public Library has four adult programs remaining on the schedule for this year. The presentations are in the Pegram Community Room at the library, 725 Pekin St., and begin at 7 p.m. Admission is free. Seating is on a first-come basis. Nov. 20 — "Herbal Seasons," with Tracy Kirby. How to grow, harvest and store herbs. Dec. 11 — "Herbal Holidays," with Tracy Kirby. Holiday cooking, decorating and making gifts with herbs. Girl Scout Jamboree Railsplitter event: weekend of Logan County Railsplitter Festival; Janice Greer, event coordinator. Two Heritage in Flight Museum members will participate in the U.S. Navy’s Blue Angels homecoming at the Naval Air Station in Pensacola, Fla., on Nov. 10-11. Each year the U.S. Navy’s demonstration team, the Blue Angels, close their air show season with a show at their home base in Florida. For several years Heritage in Flight Museum members Clyde Zellers and Jack Burke have participated in the homecoming air show. They will travel to the show in Zellers’ restored U.S. Navy SNJ-5. Clyde Zellers will be the pilot, in the front seat, and Jack Burke will be the observer, in the back seat. The SNJ-5 served the Navy pilot training program during World War II as an advanced trainer. It was used for gunnery and bomber training as well as advanced flight training. 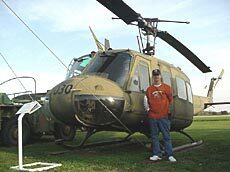 It also played a role in the Korean War, which earned it the War Bird status. Zellers SNJ-5 is part of the Experimental Aviation Association Chapter 25 War Bird Association, which is located at the Logan County Airport. You will not find Zellers SNJ-5 in its hangar during the air show season, for Clyde is a performer at air shows, giving a graceful but crisp demonstration of the aerobatics taught by the U.S. Navy from 1943 to 1958 in the North American SNJ-5. The Lincoln-based plane will be on display during the air show on the weekend of Nov. 10-11 and will be used for press and VIP flights in the days leading up to the air show. Zellers said he and Burke want to arrive at Pensacola on Nov. 7, but when they leave Lincoln "depends on the weather." He added, "We could make the trip from Lincoln to Pensacola with one refueling stop but will probably make two stops." The pilots and plane will not be making this trip this year. The Blue Angels annual homecoming air show has been canceled because of national security concerns. 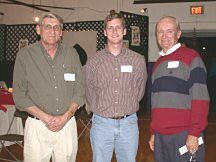 The 2001 annual meeting of the board of directors of Lincoln Community Theatre resulted in the re-election of four board members and the welcome of new director J.R. Turner of Lincoln. Returning to serve another three-year term were Marlene Perry, Marilyn Willmert, Beth Turley and Bob Wood, all of Lincoln. LCT officers elected for the next year are Louella Moreland, president; Marlene Perry, vice president; Roger Boss, secretary; and Rich Reinwald, treasurer. The Oasis, Logan County’s senior citizen center, at 501 Pulaski St. in Lincoln, is open weekdays (except holidays) from 9 a.m. to 4 p.m. The center also is open on Friday and Sunday nights for table games. Dominic Dalpoas is the executive director. Activities are open to all Logan County senior citizens, regardless of membership. The Oasis will be closed Monday, Nov. 12, in observance of Veterans Day. The daytime pinochle winner for Oct. 26 was Henry Warnisher, and on Oct. 30, Mable Hoagland won. The Friday night pinochle winner was Marjorie Reiners. Five in One winners were Ken McCray, Henry Warnisher and Joann Eckert. Harley Heath won pool honors. Harley Heath and Alice Thornton tied for pool honors on Sunday. Friends of the Oasis members receive bimonthly newsletters by mail. For more information, call the Oasis at 732-6132 or 732-5844. The local office of the University of Illinos Extension will host a series of educational presentations from September through May. Anyone and everyone is welcome. Programs will be at the Extension office at the northwest corner of the fairgrounds, 980 N. Postville Drive. Reservations will be requested; programs will be cancelled if fewer than 10 people are registered. An exception will be in November with the holiday program, for which a minimum of 25 will be required. [OCT. 30, 2001] Every year for 18 years now hundreds of people, some working all year long with a passion, have been giving of their time, money, talents and other gifts. Most of the work culminates on one particular Saturday in late October called the Harvest of Talents. Why do they do this? They all do it to help people who need help and can’t help themselves. Disasters due to drought and famine, hurricane or typhoon, earthquake or flood leave millions suffering and hungry. Proceeds from the Harvest of Talents sale and benefits all go to International Disaster Emergency Service, a reliable Christian relief organization that goes to the people and sees that they get the food and medical help they need. The cumulative total from years past was $726,017.21 in Harvest of Talents. With this year’s total to date, $66,101.92, the overall total is $792,119.13. Another $3,000 is expected in from bags of Idaho potatoes that are donated and sold. 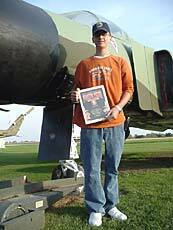 [OCT. 22, 2001] Whether it’s on the ground or in the air, aviation careers participant, mentor and aspiring pilot Ryan Wells loves aviation. The 16-year-old LCHS sophomore spends all of his free time working and volunteering out at the airport for Logan County and Heritage in Flight museum. His mother, Dawn, says, "Ryan never complains about going to work. He’s out there every weekend." How many high school kids do you know who never complain and love to go to work? Wells has his driver’s license and is working toward getting his pilot’s license in two to three years. Wells says he really appreciates his flight instructor, Larry Whitbeck, who mentors and helps him in whatever way he can. It takes a lot of money and consistent effort to get a pilot’s license, but Wells is accumulating flight time, planning and saving for it. He hopes to have it when he enters college. With enthusiasm he says, "I’ll be one step ahead if I can do that!" Then he’ll work on attaining more difficult affiliated licenses: ground instructor’s license, instrument rating, commercial rating... More licenses and higher ratings mean you can fly more, better and different airplanes. While in college he intends to join the Air National Guard and hopefully, following that, join the Air Force. Then he plans to go on to become a commercial pilot. Wells recently received special recognition for his efforts restoring and presenting information about a historic modern-day military aircraft, the F-4 Phantom II fighter plane that is on display out at Heritage in Flight museum. Retired Air Force Lt. Col. John J. Harty from Brighton, Mo. presented an award to Wells, quipping, "Anybody who would actually want to work on and paint something that big and that ugly deserves something for it." Wells listened closely as Harty, who worked on the plane primarily as an engineering supervisor for McDonnell-Douglas, shared some of his expertise on the aircraft. 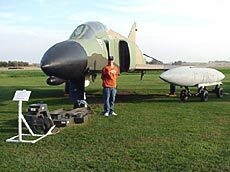 Harty told Wells that when he was first introduced to the F-4 he thought it was an ugly aircraft. He didn’t think they’d sell any. He pointed out that they were built tough and not for beauty, and they could fight a lot in battles. One of the problems they had was that in dogfights they couldn’t turn very well. Harty worked on ways to make them turn better, take more G’s and maneuver faster. "It is a strong craft, taking battle damage unlike other airplanes, [noted for] bringing pilots home safely," he said. Harty once had opportunity to fly in an F-4 when he was invited on a trip to Washington, D.C. to discuss plans to incorporate the then "newly developed inch-thick, impact-resistant Plexiglas as a windshield for it." Wells, Jack Burke and John Holmes worked on painting and fixing up the museum’s F-4 all summer. Originally a U.S. Navy airplane, it is now painted camouflage in the Air Force colors. With the painting and details nearly complete, Wells says, "We’re now looking ahead to painting and touching up other military planes and vehicles: the T-36, the A-7 and maybe even the firetruck." Wells recognizes the importance keeping the displays looking good. He holds to the model set forth, "Nobody comes to see a junkyard. They come to see a museum." He and other members are always working to "touch stuff up, making it look better." The inside of the museum has also recently been repainted, and Wells helped move in some of the new display cases that have been reorganized with expanded displays. One of Wells’ favorite experiences was this last summer when North American Top Gun came to town. He was given two hours of flight training in their SNJ World War II trainer (more commonly known as the T-6) for assisting them with loading passengers during their weekend program here. He was allowed to do the startup and taxi in this historic aircraft. In flight they did figure eights and aileron rolls. "That’s something that really excites me," he says. Wells began working out at the airport in August 2000. He is paid by Logan County to work at the airport on weekends, mowing, doing office work and pumping fuel. He also volunteers regularly for Heritage in Flight, filling in wherever he is needed. For the open house on Sunday, Oct. 8, he was out at the static displays explaining the A-7. He has gained much of his knowledge from pilots who have flown those aircraft. Visiting pilots share their personal experiences. He listens and takes notes. He also studies forms and manuals, learning all the instruments and gathering the details of each aircraft. He then makes it his task to relay that information with interest to his audience, recognizing, "Younger kids want to know what the levers and buttons do and where the weapons and their controls are located. So I explain the basics and try to keep them interested. You start getting too specific with them, you’ll lose them." Wells speaks with enthusiasm about the new aviation careers program at Heritage in Flight. As part of his volunteer work he goes to schools and speaks to the subject-related mathematics and science teachers, recruiting for the program. Fifth-grade through high school youth interested in aviation are invited to participate in the program. It meets the first Sunday of every month from 2 to 4 p.m. at the airport. Advanced registration is all that is required. Many members of the HIF help support the program, producing charts, flyers, teaching about gravity, thrust, lift, drag and aviation career opportunities. A special one-week aviation careers program is planned for this summer, when there will be workshops providing more in-depth exposure to the aviation field, including field trips to other airports and museums. This program will be limited in enrollment, with qualification and selection based on aviation knowledge or past attendance at sessions offered during the school year. Although Wells is the first official cadet in the aviation careers program hosted by Heritage in Flight, he follows in the footsteps of many predecessors. In recent years Nick Fleshman, Aaron Gray and Brad Boss have been mentored and are currently participating full-time in aviation. Twice coated with 10-year paint, the F-4 will need a new Ryan Wells to care for her in the future, someone who will go on teaching others about aeronautics and history with his same enthusiasm and commitment. [NOV. 3, 2001] Reaching the age of 100 is, by today’s standards, a milestone all its own. Reaching that age without ever receiving so much as a single traffic ticket is pushing miracle status. Or as Harold Woodhull, Lincoln’s 100-year-young and still-driving resident, would put it, basic "luck." Despite being now one full century in age, Woodhull, a widower, has never spent a day in the hospital. As a younger man, he did spend some time working as a mechanic while enlisted with Great Lakes Aviation out of Chicago. And he spent time in New York and in Boston as the captain of a 45-foot yacht, until, citing reasons unknown, "The Navy confiscated them, and we had to use the smaller boats." To which he says, "I didn’t like them as much; they weren’t long enough." In the living room of his well-set one bedroom home, Woodhull keeps many sizable, framed pictures that he says have the look of the ships he once helmed. Between them, another portrait, a vast, cultivated farming region, is reminiscent, he says, of "a large plantation I worked on in Charleston, S.C." In addition, Woodhull keeps on an end table a set of stoic black-and-white pictures of his only daughter, Grace (Houchin), who also is a resident of Lincoln. Though by his own assertion "old," Woodhull appears by no means to be slowing down. He says he began driving in 1913, making him at the time just over the age of 12. He hasn’t stopped since. Having renewed his driver’s license a few weeks ago, he shows it off proudly to anyone who asks. A spokesperson for the Lincoln driver’s license examining office says they "had no problem passing Woodhull [on his driver’s test]" and that faced with the choice of riding on an extended trip with either Mr. Woodhull or a fresh-faced, 16-year-old rookie in the driver’s seat, Woodhull would be the choice, "hands down." "I spent three years in the Coast Guard and four years in the Navy," said Woodhull. "I’d go help [the military] fight today if they needed me. But I think I'm too old now." It is perhaps this type of spirit that keeps him going so strong behind the wheel. But don’t confuse strong with fast. "Nah, I don’t speed," says Woodhull, his claim backed by the aforementioned perfect driving record. "When you’re young, that’s the first thing you do," he continued. "You get in the car and right away you see how fast you can go. But when you’re older, your attitude changes." Asked if he thought he might ever get a ticket, he responded with a large smile, "I hope not! "I’ve only been in one wreck my entire life, 10 years ago, and that wasn’t even my fault," he said. "Her insurance paid for everything. She was sick, though, so she shouldn’t have been driving." You can spot Woodhull sporting about, cautiously, in his 1978 Pontiac on his way down the street to his daughter’s or off grocery shopping, both of which he says he does often. "I don’t get out as much as I’d like to anymore, but I guess I do drive about once a day," he says. "But you have to be careful. There’s a lot of bad drivers, you know?"